Bonjour les parents! I hope you all had a restful Thanksgiving. Students started Unit 5 this week. They are learning to talk about the future. 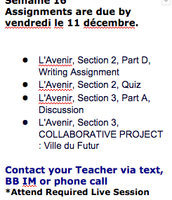 I've posted this week's assignments and next week's below. We will be working on this Unit for the next three weeks. 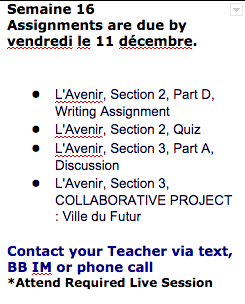 Friday, December 18 - Students should finish Unit 5. Units 3 and 4 will reopen. 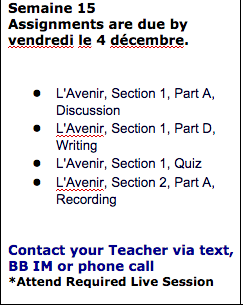 January 4-8 - Students need to complete Midterm Exam sometime during the week. Units 3-5 will remain open. 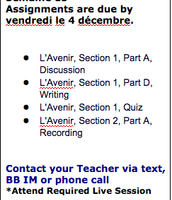 Saturday, January 9th - All units and Midterm Exam will close the first thing in the morning.